I really like this new Q’sinn Salt and Pepper Grinder Set #Qsinn. They look so elegant and look great on my table. I love having fresh ground pepper and salt on my food. They are great to use for healthy cooking and food. The grinder set is made from Brushed Stainless Steel Salt & Pepper Mill with Glass Bottle – Adjustable Ceramic Rotor. They are about 3.5 inches big and are easy to fill and easy to use. It is easy to adjust to make sure you get the grind you like. 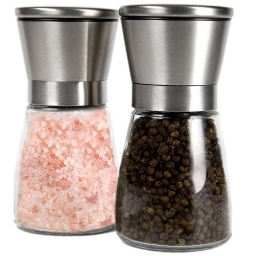 The clear glass bottle makes it easy to know when you need to add more pepper, salt or what ever spices you use. I think these would be a perfect gift for a shower, wedding and even for Mother’s Day. They are a nice quality and look elegant. Perfect for any dinner table. They are dishwasher safe and easy to store. You can purchase your own set on the link below from Amazon.com.